South Pole Rescue: Mission Succeeds As 2 Patients Are Airlifted Out : The Two-Way Two individuals have been flown out of the South Pole in the dead of Antarctic winter. It's only the third such evacuation ever conducted. 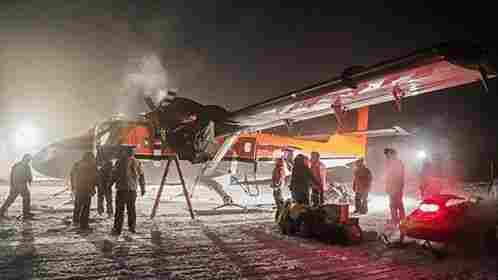 A Canadian-owned Twin Otter aircraft evacuated two people from the South Pole on Wednesday. 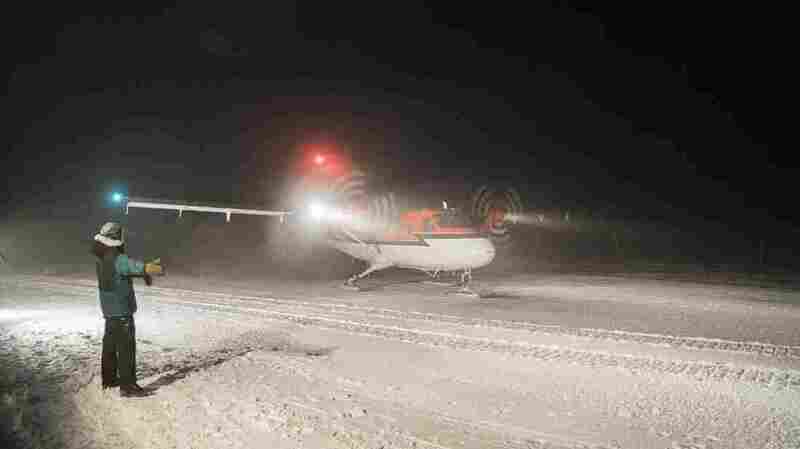 The National Science Foundation, which runs the Amundsen-Scott South Pole Station, says the Twin Otter rescue aircraft took off from the South Pole with two patients early Wednesday. It arrived at a British base 1,500 miles away shortly after 1 p.m. ET before continuing on to Chile. Macala says that landing a plane in the perpetual night is considered extremely dangerous. During the 2001 evacuation, he says, he instructed his crew to light oil drums along the runway to guide the plane in. But in the frigid Antarctic temperatures, the gasoline they used wouldn't ignite. "We had to use acetylene torches to light these things," he says. When the plane was finally ready to take off, they discovered it had frozen to the ice. "Everybody pitched in, and we rocked the wings and hit the skis with big pieces of wood," he says. "Eventually, it broke loose." Despite the risks — and a wind chill of -113 degrees Fahrenheit — Wednesday's evacuation flight appears to have gone smoothly. The NSF says a sick contractor was brought out, along with a second individual who was suffering from a medical condition. Details of the illnesses are being withheld owing to patient privacy concerns. The two workers will be treated at an undisclosed hospital.